GOP, oil companies pressure to approve Keystone XL pipeline (update 2) Idaho Year-End Wolf Population Declines 11% to 683. Livestock Losses Increase. Surprising many, a last minute bill that would grant cattle and sheep the right to vote passed in the Idaho Legislature in a late night session that began at midnight. SB9246, titled “The Livestock Equal Rights, Welfare, and Voting Rights Act”, is a sweeping bill that grants livestock the right to the vote in all local, county, state, and federal elections throughout the state and grants the livestock the right to transfer that vote to their owners as long as there is an affidavit signed by hoof in mud or feces. The bill also provides the ranchers of the livestock, now called “holistic livestock benefactor agents”, a direct tax rebate equal to that of child dependents, or $3,800 per animal per year. Additionally, the bill would trigger a redrawing of voting districts to reflect the new voters and would likely result in livestock majority districts in southern and south central Idaho. One right that was not granted to livestock was Habeas Corpus so the holistic livestock benefactor agents could still send the animals to slaughter for meat production. Little notice was given to members of the legislature who might oppose the legislation, but one member of the public, who happened to be driving by, noticed a large group of senators and cowboys herding a group of sheep into the building. Luckily this person was returning home from a costume party and was wearing cowboy garb which allowed them entry into the statehouse where they were able to observe the proceedings. With only a handful of the handful of Democratic members of the House and Senate present, the bill was quickly shuttled through committee in the Senate and then passed by those members present on the floor. The House Committee on State Affairs then quickly tried to pass the bill but one Committee member, tipped off by the disguised member of the public, showed up still in their pajamas. This member demanded that a full hearing be held on the bill in the committee and that testimony be taken from the public. When the Committee chair granted this request there were only supporters of the bill present so no opposing testimony was given. Supporters of the bill said that their livestock needed to have the vote so that their holistic livestock benefactor agents could ensure that their best interests were being represented in matters of importance. They rationalize this massive change would better insulate the livestock from being pushed off of public lands by burdensome environmental regulations. Supporters also believed that the state would be granted two extra electoral college votes in presidential elections and two extra seats in the House of Representatives once the census is completed in 2020 although they asked for a resolution demanding that the changes be implemented immediately by the US Congress. Another provision in the bill provides for a taxpayer funded, single-payer health care system for the livestock and their holistic livestock benefactor agents. Also included in the bill is funding for special schools that could be used only by the livestock and the children of the holistic livestock benefactor agents. These schools would be built at the site of individual ranches with ownership of more than 2500 livestock and would be outfitted with all of the latest educational equipment, schooling for other, smaller operations, especially for livestock in urban areas, would not be funded just out of principle. Cattle and sheep will also be able to run for state, county, or municipal offices and could also be appointed to vacant seats by the Governor. As with votes, those seats could be transferred to the owners of the livestock. Cattle, sheep, and their owners would also be immunized from trespass laws and laws against vandalism. This provision reinforces the open range laws already in existence throughout many western states which force private property owners to build and maintain fences to keep livestock off their property. A fine for vehicle collisions would also be levied against the driver or surviving passengers of any vehicle that hits livestock on any public road. The fine would be $11,400, or equal to three years of direct tax rebate given to the holistic livestock benefactor agents, and would have to be paid in full to the holistic livestock benefactor agents within a week of any such event. To memorialize this bill the capitol dome would receive a special leather awning to make it more resemble a cowboy hat. The conservation group, Idaho Friends, initially balked at the bill but later came out with a statement supporting a provision added to the bill which designated a 30 square foot area at the top of Mt. Borah as a state wilderness. The lieutenant governor, who is sitting in for the governor while he is in Las Vegas to attend a rodeo, is expected to sign the bill into law later today. The new law will probably result in litigation but, since cattle and sheep can be appointed to courts, the opposition will probably be unsuccessful in overturning the law. What’s sad is that this could actually happen in Idaho (or Wyoming, Utah, Montana, Arizona and New Mexico!!). Thanks for the laugh! In effect that is what they have done. When you look at the legislation written and introduced by the Idaho Farm Bureau Federation you can see that there is no interest in democracy at all. So much for the one man, one vote concept. They want it to be harder te get an initiative on the ballot. This is direct retribution against those who successfully overturned the education laws last year but it is also to maintain the hegemony that rural districts have over urban districts. Well it is a feudalistic land baron state. Do you expect Idaho to evolve into the twenty first century when it’s still stuck in the thirteenth? Don’t give our rural New Mexico legislators any ideas. Nice job. The only suggestion I could offer is that it could have been a broader “ungulate” bill that allowed not only cattle and sheep the right to vote, but elk, deer, and moose, while disenfranchising bison, and confining them to small reservations in neighboring MT. Maybe it started out that way in the original bill, but was amended to just cows and sheep, in Committee, reflecting Idaho’s real power base. Thanks for the sardonic humor this fine Spring day. What’s funny (an sad)is the fact that I was almost believing this for a while. Given the idiocy that usually goes on in western state legislatures I wouldn’t put this past them. Why not give wolves a vote ,they are more natural they eat natural food, not cattle or farm raised anything.This is crazy Ken! Great job, Ken. Had me going for a minute. Although this could be true any other day of the year as well. With only a handful of the handful of Democratic members of the House and Senate present, the bill was quickly shuttled through committee in the Senate and then passed by those members present on the floor. Ha! I was thinking along the lines of their Washington counterparts. Do they ever work or are they always on vacay? But this part is already real though right? I assume since the bill did not include asses along with cattle and sheep it is because the asses are already are well represented. Bahahah, Had me going for a while mainly because I lived in Idaho and it would not have surprised me in the least, The one good thing as I was reading this was would allow sheep and or cows to hold office, Ha! they would do a better job than the idiots in there now!! Good April Fools joke loved it!! Sheep and cattle have had their brains bred right out of them, which means the newest voters will do better than the existing voters seem to have done. 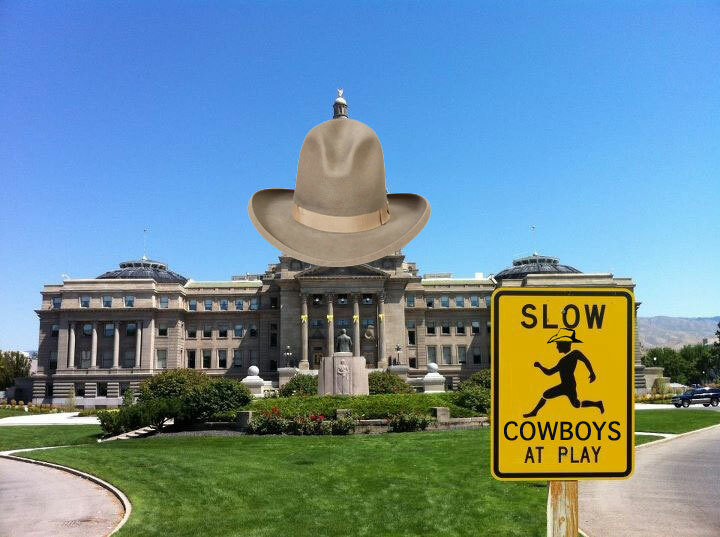 I want one of those “Cowboys at Play” signs.